Nail beauty is no more restricted to just coating your nails with your favourite colour. It has gone much beyond that and has accommodated new styles and techniques which decorate your nails and beautify them. The hip and fashionable nail dangles that come in different patterns and styles are an absolute stunner. 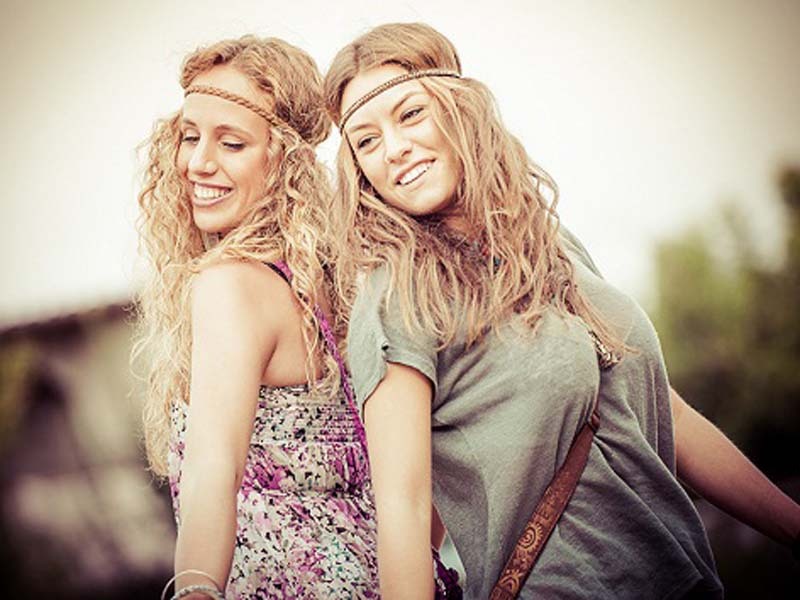 The designs are varied, are different and utterly innovative. You can always pick yourself something out of the plethora of nail art designs. But since, Halloween is nearing, we have enlisted some of the best designs just for you, so that this Halloween you will be encouraged to get something like this for yourself. 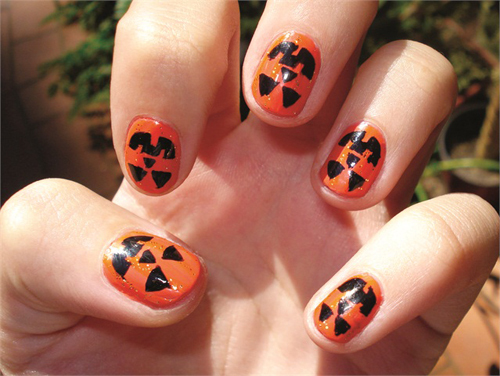 The Pumpkin Halloween nail art design is just fascinating. The colours are so rich and deep. The laughing pumpkin brings out the theme of Halloween and looks amazing on your nails. This design is so unique that it will surely add a glamorous sheen to your identity and make you stand out no matter which Halloween party you’re attending. Spiders are scary creatures and stand as strong symbols of Halloween. 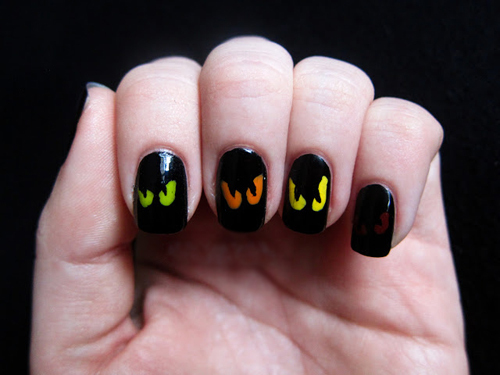 They make great designs for Halloween and you can definitely use them on your nails. 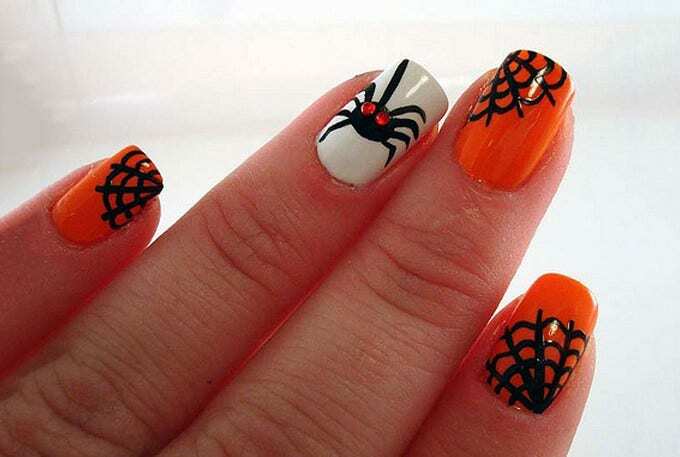 You can also add the image of spider webs to give it a more strong and spooky look. 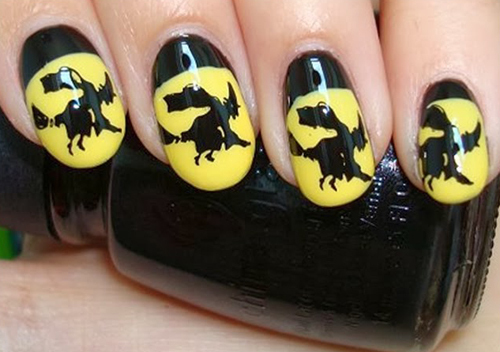 This is the best Halloween nail art ideas. The Egyptian Mummies are a legend. They are so popular that even on Halloween people remember them. 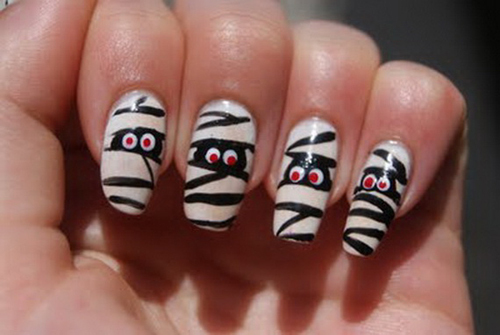 You can get yourself something as cool as the Mummy Halloween Nail art design and flaunt it to all your friends this Halloween season. 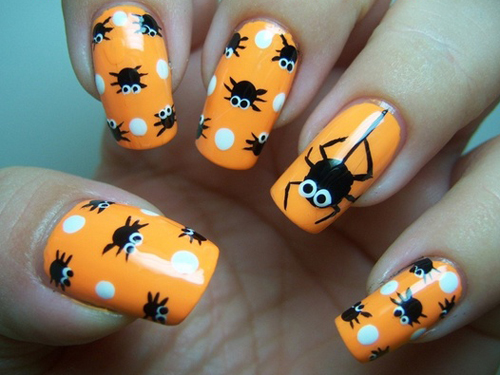 The Bugs Halloween Nail art design is very cute and girly. They look fine and just perfect for your upcoming Halloween party. You can use a combination of patterns and shapes to make this design look attractive. 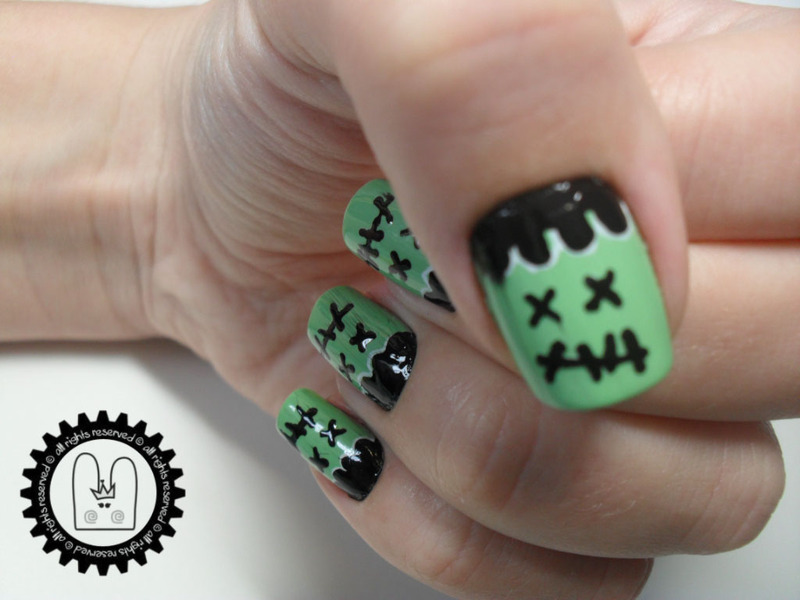 The spooky Halloween nail art design is sure to scare the person sitting next to you. 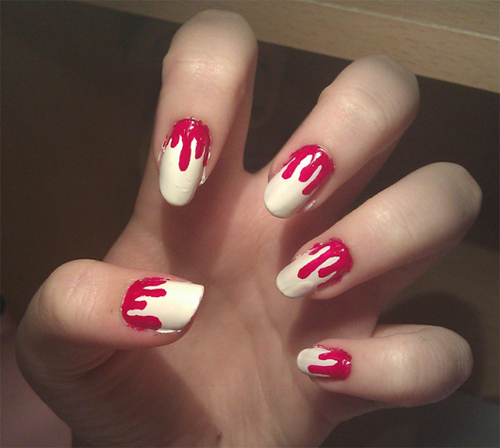 The styling looks so realistic; as if real blood is running down your nails. Getting this design along with your Halloween costume is sure to be hit this October. Zombies are typical Halloween characters. We have seen them in all scary movies when we were young and they still give us goosebumps. For this Halloween, you could really experiment with the Zombie Halloween Nail Art design as this will make you look unique and also create the atmosphere of eeriness and horror.. The Scary Eyes Halloween Nail Art design is one of the best nail art designs seen till now. They image of bright shining eyes staring at you in the cold of the night creates a feeling of sinister and evil. Getting this design for Halloween will surely get you a lot of compliments. The moment we think of Halloween, the first thing that comes to our mind is witches. Witches are evil characters who are supernatural by nature and have immense potential to cause destruction. 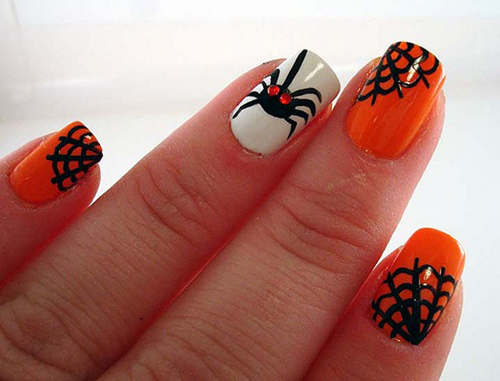 They were and still are some of the most popular Halloween nail art designs. If you could get something like this for yourself, there would be nothing like it. 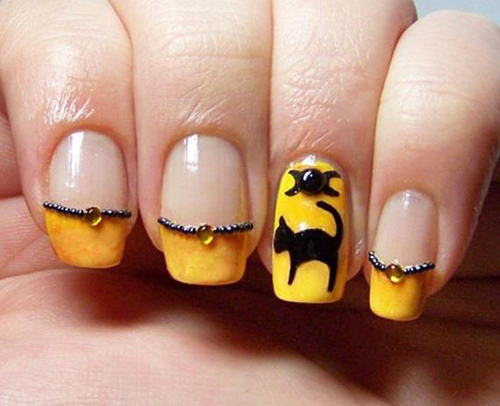 This is one of the best Halloween nail art design. Black cats are the top causes of superstition today. People fear them a lot and some even think they are a bad omen. These qualities make them perfect for your Halloween nail art, although can use some unique styles and patterns like these to make them look stylish and cool. 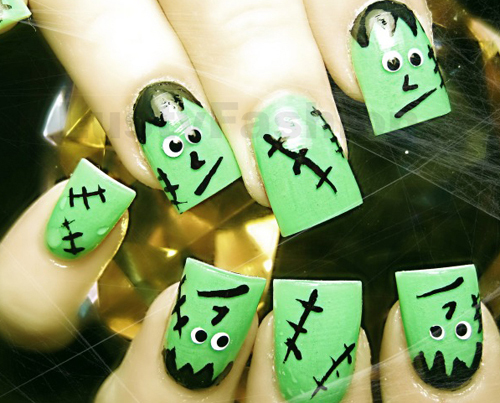 Halloween nail art designs are popular and rich look for Halloween party. ← Previous Story How To Remove Mehndi from Skin and Nails? 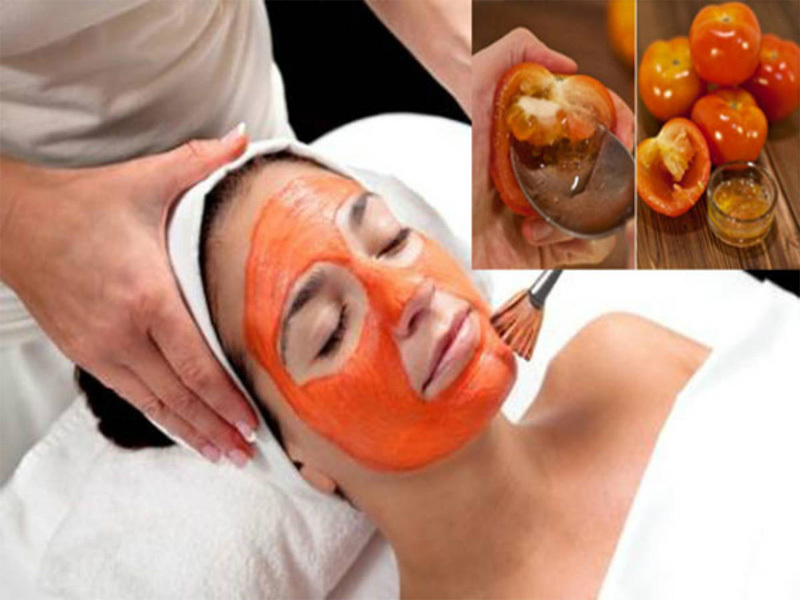 How To Use Almond Oil For Acne Scars?